Remarkably it is still possible to pick up a beachside property in Spain for less than €100,000 (that's under £85,000 UK Sterling). This issue of Costa Blanca Property For Sale focuses on the best bargain homes available right now on the Spanish coast. We really do have something to suit every budget with lovely apartments for sale from just €52,900 (less than £45,000 UK), and a bank owned townhouse only 100m from the nearest sandy white beach for just €60,400. These homes all offer outstanding value for money, situated in sought-after beachside locations. 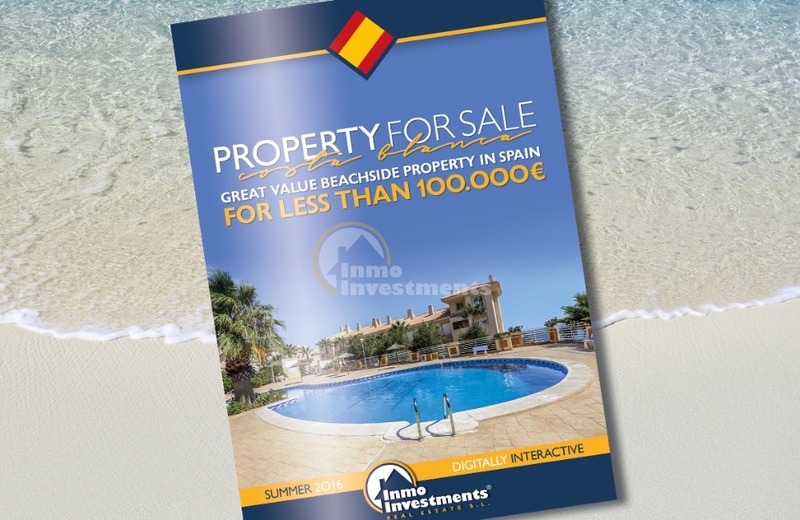 Peruse page after page of property bargains across the Orihuela Costa, read our feature on the truth behind repossessed Spanish properties, and our latest guide is digitally interactive too! Just click any property image for more information straight to your phone, pad, or tablet. You don't need to be wealthy to own a beach home in Spain. With prices at their lowest ebb and Spanish property prices & demand on the increase, this is an ideal time to purchase a home on the Costa Blanca. Click the download button above, or click here to read our latest exclusive publication. (PDF download, 4.8mb). Please note: We have taken every precaution to ensure the accuracy of information and data at the date of publication. However properties, prices, and exchange rates are subject to variation and availability.